An online platform has been launched for central government employees to apply for leave and access their service-related information, according to an official statement issued on Monday. Personnel Information System- which has functionalities of self-updating by employees. Leave- Leave of all kind may be claimed and sanctioned through website that will become part of service book. LTC- All function related to LTC application, Eligibility Check, Sanction, Advance claim, Final reimbursements, Leave encashment. Loan/Advances- All kind of loan and advances can be claimed, sanctioned and paid through it. Tour: - All tour applications to be submitted through system and TA advance may also be claimed. The Union Minister of State (Independent Charge) of the Ministry of Development of North Eastern Region (DoNER), MoS PMO, Personnel, Public Grievances & Pensions, Atomic Energy and Space, Dr Jitendra Singh launched the electronic-Human Resource Management System (e-HRMS), here today. He launched it during the observance of Good Governance Day by the Ministry of Personnel, Public Grievances and Pensions. The Minister launched the 25 applications of 5 modules of the system. The e-service book launched for DoPT during March this year will also be integrated into the e-HRMS. Speaking on the occasion, Dr Jitendra Singh said that Good Governance Day is observed to mark the birth anniversary of former Prime Minister Shri Atal Bihari Vajpayee. He said that under the leadership and inspiration of Prime Minister Shri Narendra Modi, the Government has taken various initiatives to attain the goal of ‘minimum government, maximum governance’. He said that the launch of e-HRMS is also a step towards the ‘ease of governance’. The Minister further said that this is an initiative by which the technology will be put to the optimum use. The other departments and state governments will also follow this system in due course, he added. Dr Jitendra Singh also spoke on various other initiatives taken by the Government such as launch of PRAGATI, self-attestation, discontinuation of interviews for lower level posts, ‘Anubhav’ initiative, digital life certificate (Jeevan Pramaan), abolition of obsolete rules, online RTI portal, etc among others. He said that the Government has been able to expedite various stalled projects, due to the initiatives such as PRAGATI. The Minister also said that the Government has revolutionised the entire structure of Civil Services Day in the recent years, with more participation and enthusiasm by young district collectors. He also said that the DARPG is organising regional conferences at different parts of country, which is taking good practices of governance to other parts outside Delhi. He further said that the due to the prompt response, the grievances lodged with the Government have also increased. The Minister also said that Government is adopting a policy of intolerance towards non-performing officers and encouraging the performing officers. All these initiatives are in the direction of citizen-centric approach of the Government, Dr Jitendra Singh said. Speaking on the launch of e-HRMS, Ms Neeta Verma, DG, NIC said that the software will give a comprehensive and combined view of the human resource deployed by the Government. She also said that it is a cost-effective initiative, thus sustainable in the long-term. It will also provide HR analytics for the Government, she added. She further said that it will help Government to post right man at right post, thus extract best of an employee. 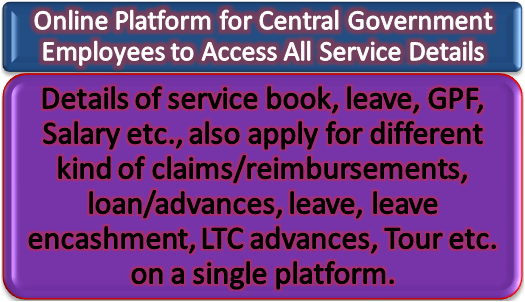 With launch of e-HRMS, employees will be able to not only see all their details w.r.t service book, leave, GPF, Salary etc., but also apply for different kind of claims/reimbursements, loan/advances, leave, leave encashment, LTC advances, Tour etc. on a single platform. Employees shall not be dependant for data updating on administration, but they may themselves update the data with their login subject to verification by concerned administration. They will be able to track status and match details instantly. The system is designed in a way to obtain all management related inputs/reports through its Dashboard and all pendency of data updating as well as claims will be seen online by senior authorities that will instil more responsibility and accountability among all government servants. This is a step in the direction of fully automated Human Resource Management System with a target to bring all employees of Government of India on employee portal so that all processes of personnel management from hiring to retiring will be on digital platform and manual system of handling personnel management will be dispensed with. After training to the employees, these modules will be fully functional by next month and remaining modules will be developed by end of this financial year. Next month a workshop will be conducted calling all ministries and departments and they will be asked to take necessary steps for its early implementation in their ministry/departments. This system has various advantages such as providing Dash board for employee and management, Updated service records, E-governance in office procedures, Reduced file movement, Faster service delivery, Assist in decision making, Common document repository of employees, Standardization of Master Data, Minimize manual entry of data, Ease of sharing information among stake holders, e-Sign for accountability/authenticity, PFMS and e-HRMS integration for faster payments of GPF, advances, Loans, reimbursements. This will reduce employee’s grievances to a certain extent. Even availability of online data of employees will help organisation to take many administrative decisions easily like planning of recruitments, posting of official to a task as per their experience and qualification, easily available online to the administration. It will also help employees to concentrate more on public service once free from personal anxiety of getting their due work done. That will enhance public delivery more satisfactory and more employees will be available for core work of the Government than maintaining of Service Book. Availability of centralized data will enable Government for policy research and planning as such educational qualifications and other competencies and deficiencies may be easily obtained. It will enable Government to take transfer and posting decisions more pragmatically based on reliable first hand data. The e-service book for DOPT employees launched on March 30, 2017 was also an initiative taken to fully automate it with live updating of all records. It was envisaged to go on a bigger and single platform for all central government employees and all transactions from Hiring to Retiring of a government servant should be fully automated. “They will be able to track status and match details instantly. The system is designed in a way to obtain all management-related inputs/reports through its dashboard and all pendency of data updating as well as claims will be seen online by senior authorities that will instill more responsibility and accountability among all government servants,” the statement read. This is a step in the direction of a fully automated human resource management system with a target to bring all government employees on employee portal so that all processes of personnel management from hiring to retiring will be on digital platform and manual system of handling personnel management will be dispensed with, it said. The e-service book, which carries all service-related details of an employee, launched for the Department of Personnel and Training (DoPT) in March will also be integrated into the e-HRMS, the statement said. The minister launched 25 applications of five modules of the system. The five modules include personal information system which has functionalities of self-updating by employees and the one for claiming and subsequent sanctioning of all kind of leaves. The third module is on the Leave Travel Concession (LTC), loan/advances — where all kind of loan and advances can be claimed, sanctioned and paid through — and on tours that allow submission of a tour-related application and sanctioning of travel allowance advances. “The availability of online data of employees will help the organisation to take many administrative decisions easily like planning of recruitments, posting of officials to a task as per their experience and qualification, easily available online to the administration,” according to the statement. “It will enable government to take transfer and posting decisions more pragmatically based on reliable first hand data,” the statement read.